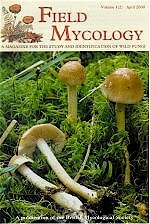 Field Mycology is edited by Geoffrey Kibby and is published by Elsevier. Last updated January 2019. Copyright © 2000-2019, all rights reserved.